The new StoryWalk® book at the Thielke Arboretum is The Little Red Fort by Brenda Maier and illustrated by Sonia Sanchez. 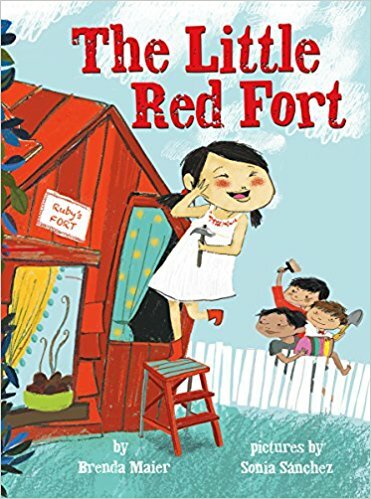 In The Little Red Fort, Ruby, a young girl whose mind is full of ideas, decides to build something using old boards that she finds. Her brothers refuse to help so she embarks on the project alone. Soon her creation is ready and what a creation it is. Everyone wants to play in her fort. If you haven't experienced the StoryWalk® concept before, this is an excellent opportunity to explore and build reading confidence in children. StoryWalk® is an innovative approach to encourage people of all ages to get out in nature and read at the same time. The StoryWalk® concept was created by Ann Ferguson of Montpelier, VT and is currently used in 48 states and four countries. This StoryWalk® will be up throughout the summer. Enjoy the outdoor reading experience over and over. The StoryWalk® is free, but donations are always appreciated. And, support our generous business owners as they have supported StoryWalk®.